Payton Gritas discovers her father has a life altering disease and that her family has been keeping it a secret from her for months. She's scared and completely unable to deal with it, so her guidance counselor suggests she choose something else to focus on, and by focusing on something else she'll eventually be able to come to terms with this life changing information. Payton struggles to choose something as her focus object and eventually settles on the head of the boy who sits in front of her in biology class, Sean Griswold. I'm pretty sure you can guess what happens...the more Payton focuses on him, the more she grows to like him, and it's all pretty awesome because he's a great guy who helps her deal with her problems and grow as a person. These are the kind of romances I like to read, and the kind I especially like to find in YA...healthy relationships that are still romantic and sweet and free of any soulmate burden..just a guy and a girl that like each other in that special way and get along and make each other better. But lest you think this is only a romance, it's not. This is really about Payton and how she comes to term with life--the risk of loss in love and dealing with this new illness of her father's and growing up and making amends to her friends and family when she hurts them and learning to see that people are more than the image they project. It's a really sweet and positive book and I enjoyed reading it so much. Also, Payton is a girl athlete! She's both a basketball player and she takes up cycling in the book. 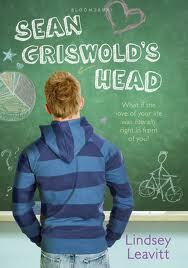 If you enjoy sweet contemporary romances in YA, then I'm pretty sure you'll enjoy Sean Griswold's Head. I have one copy courtesy of the publisher to give away. This is open to residents of the United States. Open until March 24th at midnight PST. Winners will be notified by email.